As good as it gets when you want the steel penetrator projectile. The XM855 is the commercial version of the mil spec m855 which is legendary in the 62 grain 5.56x45 load. Out of 1:7 and 1:8 twist barrels this stuff is incredible. 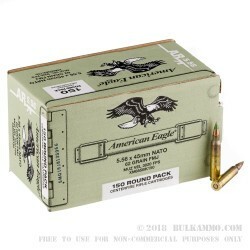 Probably not your best bet for indoor ranges (most won’t allow 5.56 let alone the penetrator steel core stuff), and probably better suited for tactical or long range outdoor work, this is legitimate ammunition that flies out of the barrel at 3020 feet per second and delivers 1255 ft. lbs. of energy at exit. This is the Federal Lake City 5.56 your Mama warned you about. It’s priced well, well suited to a variety of tasks, and proven in battle. No really. How many 5.56 rounds on the market can say that? Not too many. The reasons to buy this outweigh any reason you can think of not too generally speaking. It’s just plain reliable, hard hitting, works in most guns on the platform without any loss of accuracy or range and it has the reputation for crushing the opposition. Suitable for use in the 5.56x45 of your choice but prefers good old Aluminum and Steel “M’s” “AR’s” and clones. 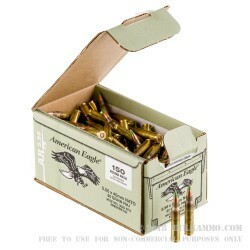 Packed 4 boxes per case, 150 rounds per box loose packed. Q: Are these new rounds or reloads? A: Hello Larry, This Federal ammunition is all new manufacture. Q: Can you give some ballistic info on ammo such as feet per second &energy at muzzle ,100 yards & 200 yards ? A: The muzzle velocity is 3104 fps with a muzzle energy of 1326 ft. lbs. These will change slightly based on environmental conditions and the velocities at distance will be even more impacted based on those conditions. 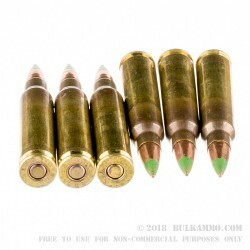 Q: Are these particular rounds steel core?? A: Hello Keith, Yes, these 62gr. FMJ rounds by Federal in 5.56 do have steel in the tip and will attract a magnet. 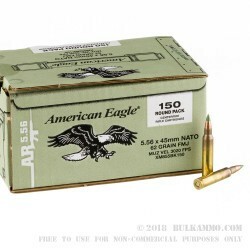 For non-magnetic rounds in 5.56, I would suggest the 55gr. XM193 rounds which have a lead core, copper jacket, and a brass case.